Driftsun also has a tandem version of their Teton kayak, but if you are looking for something lightweight and compact, then this is the one to get. The Driftsun Teton 90 is a 9' kayak with a width of 32" and a weight of 47 lbs. It is a sit-on-top kayak, designed to be used by a single person and has a weight limit of about 300 lbs. The Driftsun Teton is constructed from UV resistant rotomolded single piece HD polyethylene and, according to Driftsun, it has been designed to handle everything from lake and river exploration to ocean fishing and multi-day camping trips. This kind of versatility makes the Driftsun an appealing option for anglers in need of a kayak that can handle more than just fishing. In addition to being very compact, the Driftsun Teton also offers a lot of maneuverability. Despite its small size, it is also relatively stable and able to handle all kinds of water conditions with ease. 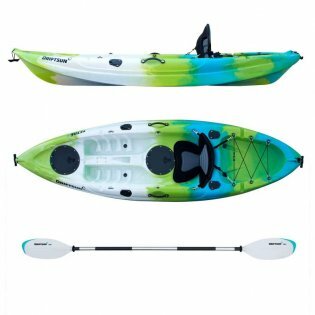 It also does not feel as cramped as other small kayaks and the premium padded EVA seat with its high back support also helps a lot with comfort, especially if you spend extended periods out on the water. The seat is also adjustable and can be removed if you want to replace it with something else. Typically you don't get a lot of storage space with a 9' kayak, but the Driftsun Teton does offer two sealed dry storage hatches along with a rear tankwell that has bungee. Kayaks in this size class usually offer two rod holders, but the Driftsun Teton features no less than four flush mount capped rod holders, which is quite impressive. It also comes with an optional mounting point for Scotty accessories, In addition, it also has side bungee paddle parks and two paddle rests. While not the best on the market, the aluminum performance kayak paddle with ergonomic grip that is included in the package does get the job done. Depending on how much gear you enjoy taking along with you the Driftsun Teton is a good fishing kayak with enough versatility to be used for more. It is going to be too small for some anglers, but those looking for something a compact and manageable on their own won't go wrong with this one.